I will introduce Japanese paintings designated as National Treasure. The categories vary, Buddhism painting, picture scroll, portrait, ink drawing, pitures on partition and so on, It is difficult to define what the Japanese painting is, but Mr. Fenollosa who came to Japan in early Meiji era characterize it as follows. 1. It doesn't pursue realism like a photograph. 2. There is no shade. 3. There is outline around the object. 4. Color is not deep. These characteristics gave influence to the birht of Impressionism in late 19th century in Europe. Now, let's see the masterpieces by the category. Wall painting of the Takamatsuzuka Burial Mound is the only one wall painting designated as National treasure. It was painted on the plastered stone during Fujiwarakyo era (694-710). Figures, God, constellations, etc were painted. Among them, vividly colored women figures called 'Asuka Beauties' are especially beautiful. Buddhism paintings are the pictures painted by the Buddhism belief. Buddha personified paintings are the pictures painted by the belief that God (of Shintoism) is personified by Buddha. Soshizu is a portrate of the founder (soshi) of Buddhism sect. Portrate of Jion-daishi, Shotoku-taishi (image on the right), Tendai-koso (image on the right), Shinran-shonin are examples. Yamato-e is the style concept against Kara-e (Chinese style painting). It is Japanese style painting which developed during Heian era when they emphasized on growing national culture. Picture scroll is one of the traditional Japanese picture styles. They make very long picture plane by connecting rectangular paper (or silk) and they express the scenes and stories consecutively. Mostly picture and word explaining the picture are on the scroll, but sometimes there is only picture. Emaki is a kind of Yamato-e.
'Genji Monogatari Emaki' was made in late Heian era (11th century). It was based on the story 'Genji Monogatari' written by Murasaki Shikibu and picture is said to have been painted by Takayoshi Fujiwara. It is also important as a historic document which shows the life of aristocrats. 'Choju Jinbutsu Giga (Caricature of Birds, Animals and Human)' was made in 12th or 13th century with personalized rabits, frogs and monkeys. It is said that this is the oldest Manga (cartoon) in Japan. The portraits of Emperors and Shoguns are designated as National Treasure. Suiboku-ga is a picture made with only one color of Japanese ink. Using the ink not only for drawing lines but also for painting the surface expressing contrast by feathering. It was started in China in late To era for landscape pictures and according to the difusion of Zen Buddhism, history and figures of Zen Buddhism were made by ink drawing. It was brought over to Japan during Kamakura era (13-14 century) with Zen Buddhism. 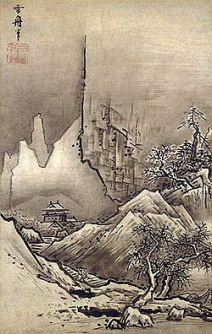 At the begining, they drew pictures to express the ideas of Zen, but gradually, they started to draw landscapes. During Muromachi and Edo era (14-19 century), Kano School (for example Eitoku Kano) and Rin School (for example Sotatsu Tawaraya and Korin Ogata). They made gorgeous pictures on partition. Among imported pictures, some Buddhism paintings and landscape paintings from China and Korea are designated as National Treasures.